Girl with a Pearl Earring: The BIG TBS HAUL!!! From the archives December: All the good work and progress I made over past few months have been undone. I succumbed to temptations and splurged at TBS. I have been wanting to go there forever, but somehow held back and passed by every time, peeking into their store. 3 months without SALARY, and I kept my essentials to the bare minimum. I was going through a job shift, and most importantly was surviving on my reserve cash. December and the green paper goddess blessed me in abundance, dues were cleared off by my previous employer and the new salary stack made me a happy bunny. I held on to the self restrain until yesterday, but finally I just gave in....common!! !a girl needs some fun right??? I knew what I wanted, entered the TBS and went shopping like an elephant left loose in a sugarcane field. At the end I payed around 6K, including the membership fee. I walked out of the shop with a heavy paper bag and a lighter wallet. 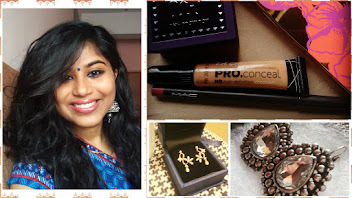 As part of membership, I got 300 rupees off on my purchases and a lip roller in cherry free. Later we hit MAX, and me and husband liked a pretty fluorescent highlight birdy top, costing 599 bucks. In the cash counter I asked the cashier if he could redeem my husband's card points. The SA told us that we needn't pay for the top, as my husband has over 1000 points in his account. I got the dress for FREE!! !wooohooo.....he still has some points left so, I may lure him to go shopping with me again this weekend. If you guys are inner circle member, then it's time to redeem those points. The points get expired by year end. Oh by the way, did I tell you that we are travelling to Pune this weekend to attend my husband's niece's naming ceremony?. It would be our travel trip after 4 months of decaying on the weekends. Wow! I love TBS too..all your shopping is enviable :-) and a freebie sounds like the icing on the cake, enjoy yr weekend! Take a look at my blog if you get a chance, for a fun give away! That is quite a haul!!! My only purchases from TBS have been perfumes. Whenever I think of trying something else, I look at the price tag and shrink back, going back to my drugstore brands :-). One of these days, I should just give it a go - and your haul has tempted me!! hehhe...happens..it happened with me once too!!! 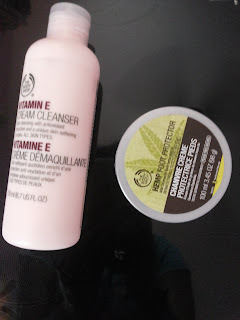 I use some of the stuff you bought regularly - vitamin E cleanser n toner are awesome on my skin. loved using shea shower cream i winters and love the hemp cream for hand and foot!! !